Simon (Devin Mackinnon) and Jake (Edmund Stapleton). Photos by Barsin Aghajan. 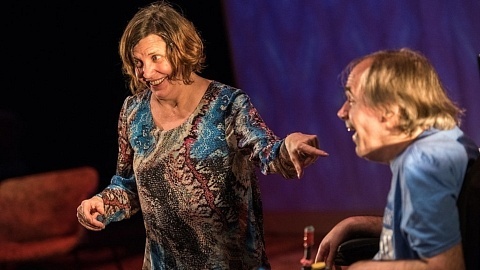 Laughing and learning – what more could you want from a children’s show? These are just two things that you will do while watching Carousel Players’ Spelling 2-5-5, directed by Jessica Carmichael, which played in Robertson Hall on January 29th and 30th. Written by Jennifer Overton, Spelling 2-5-5 follows the story of two young brothers, Jake (Edmund Stapleton) and Simon (Devin Mackinnon). The relationship between them is a unique one. Jake, along with being a whiz at math and art, has Autism Spectrum Disorder. Simon, extremely talented at spelling, has been given the role of caregiver for his brother. He has to make sure that everything goes smoothly for Jake when their mother (Tara Koehler) is not around. He reads Jake his favourite superhero comics and watches out for him at school. Although he loves his brother, Simon feels like Jake gets all the attention in his family. When he learns of an opportunity to audition for a televised spelling competition, Simon jumps at it. He believes that if he wins, he’ll get the attention he deserves. Simon’s friend Laurie (Cynthia Hicks) discovers during the first round of auditions that Jake is also a talented speller – but instead of spelling with letters, he spells with numbers. Throughout the hour-long show, the actors are able to successfully transform — in particular Hicks, who hilariously portrays in quick succession three characters auditioning for the spelling competition, indicating the switches by small costume changes. The actors transform the comic-book- themed set into multiple locations by moving separate pieces that come together like the toy K’NEX. Edmund Stapleton’s performance as Jake is incredible. He brings life to the character of a young autistic boy who will make you laugh and cry. With the help of Autism Ontario, Stapleton was able to portray a character that not every actor would be able to perform convincingly. Mackinnon also offers a magnificent portrayal of how hard it can be for caregivers. Autism does not solely affect a single life. This is not just a show that children can enjoy and learn from, but one with much to offer adults as well. From early on, society ingrains in children’s minds that to be different is to be weird. Carousel Players’ heartwarming production of Spelling 2-5-5 delivers the message that everyone’s difference makes them special. 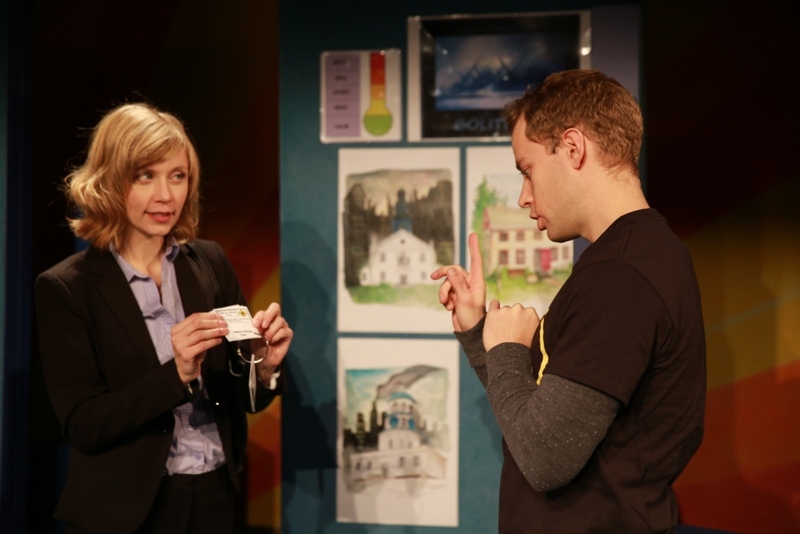 With great sensitivity, educational value, and the help of devoted actors, the production tackles the subject of Autism Spectrum Disorder (ASD) thoughtfully through a story that can be enjoyed by both children and adults. Tara Koehler (Mom) and Edmund Stapleton (Jake). Photos by Barsin Aghajan. Spelling 2-5-5, written by Jennifer Overton, follows a 14-year-old boy named Simon (Devin Mackinnon) whose mother (Tara Koehler) frequently tasks him with taking care of his brother Jake (Edmund Stapleton) who has ASD. After hearing about a televised spelling bee competition, Simon must learn how to share the spotlight with his brother and discover the importance of being unique. The company has made the performance “sensory safe,” leaving a space at the front of the auditorium for children to get up and walk around if needed, keeping the volume of sound effects low, and ensuring the lighting is not too intense. 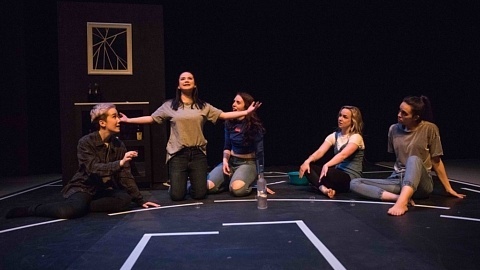 Although the audience on the day I saw the show was made up of more university students and adults than young children, these production choices reinforced the play’s message of the power of friendship and acceptance, creating an extremely sympathetic atmosphere for young audiences, some of whom may have ASD. The set consists of about five blue puzzle-piece-shaped blocks that move around on wheels to create different locations. 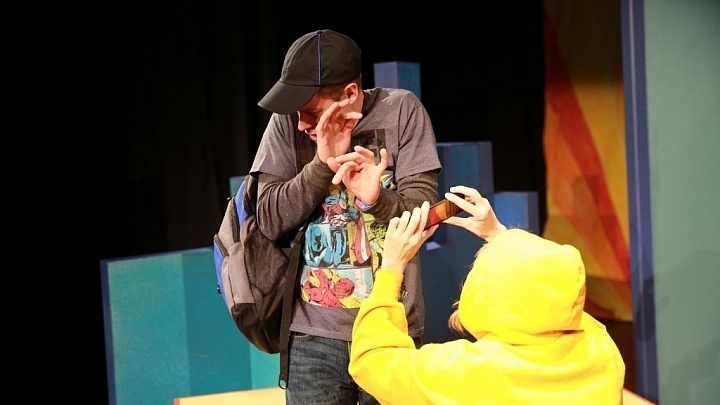 The actors move the pieces swiftly during scene changes with no long pauses, which is especially effective in a production targeting children. The actors’ ability to stay in character during the scene changes was impressive and often achieved through subtleties like their facial expressions. After the audience is introduced to Simon’s friend — and crush — Laurie (Cynthia Hicks), the pair move two blocks close together, exchanging a quick innocent blush and smile before continuing to the next scene. This sort of character commitment keeps the story in motion for the entire production. Carousel Players’ production of Spelling 2-5-5 is truly the perfect mix of both education and fun that children and their parents can enjoy. 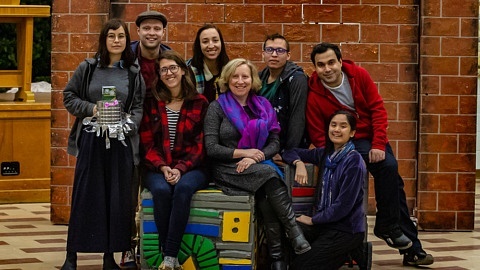 With an impeccably trained cast, the show informs the audience about ASD in a way that is both considerate and honest, reminding us all to embrace our individualism.